Rally Point 7 is the first Schwerpunkt product to contain non-original material. The rationale for the product is to allow people who have not previously tried Schwerpunkt a chance to sample a variety of its wares. 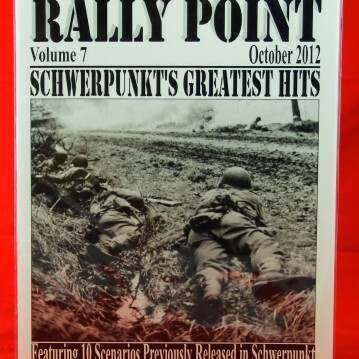 However, it has also been no secret that producing a volume of Schwerpunkt and an original Rally Point pack each year was taking its toll on the Tampa crew and issuing a reprint pack in lieu of an original Rally Point gave the Schwerpunktians a bit of breathing room and perhaps allowed them to escape a bit of burnout. 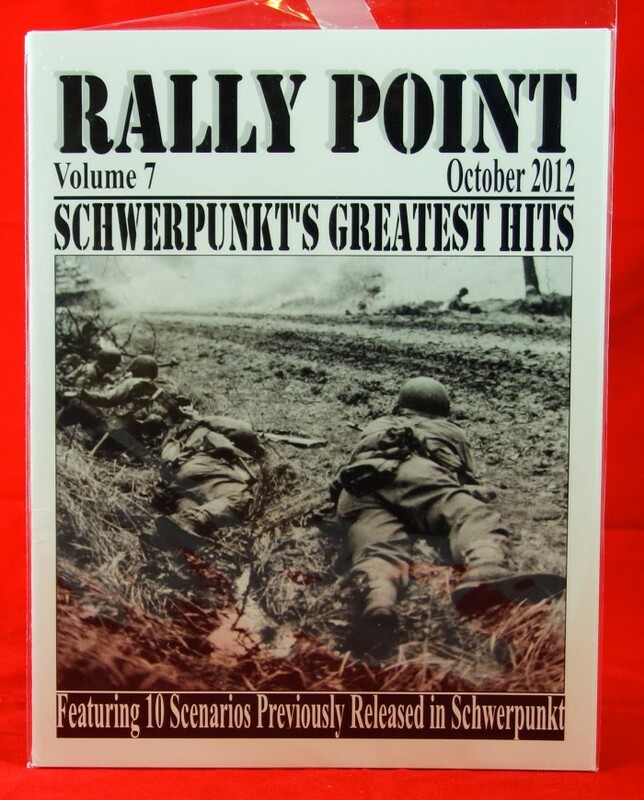 Despite its title, the pack doesn’t really contain Schwerpunkt’s “greatest hits.” In fact, it only contains scenarios from the first 10 issues of Schwerpunkt–one scenario from each issue. Obviously, some issues (and this means YOU, Volumes 5 and 6) were not as good as others, which means that some excellent scenarios were left out of this pack. All of these are quality scenarios, playable and balanced (except perhaps Wollerscheim! ), so ASLers can’t go wrong with them. 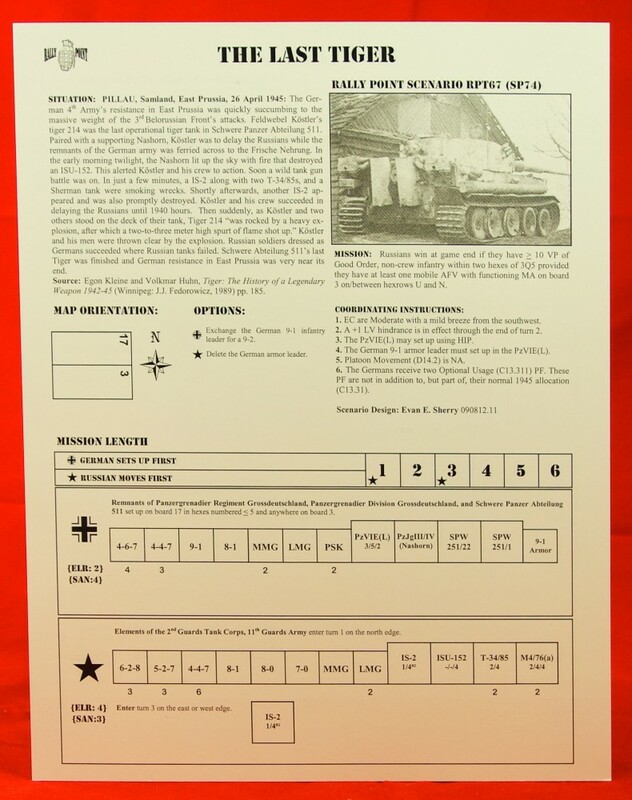 Scenarios that did not appear in this pack, but easily could (or should) have, include SP2 (Holding the Hotton Bridge), SP14 (The Green House), SP34 (Frankforce), SP65 (Ayo Gurkhali! ), SP80 (Die Gurkha Die! ), SP95 (Burn Gurkha Burn! ), and SP96 (Husum Hotfoot). It is odd that almost all of the scenarios selected are either American vs. German actions or Soviet vs. German actions. Not a single PTO scenario was selected. SP95 (Burn Gurkha Burn) is probably the most glaring omission. Anyway, for ASLers who have not yet tried the taste of Schwerpunkt, this is a can’t-miss way to get your grub on.